This is the Signed original Pen & Ink drawing by Maroc. 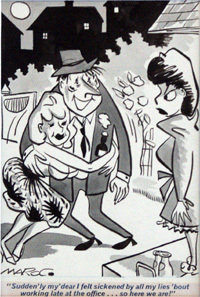 One panel gag cartoon from Parade Magazine vintage 1960s. "Maroc" was the pen name of Robert Coram who contributed to London Opinion, Answers, Blighty, Inky Way Annual, Weekend Mail, Passing Shows, Sunday Chronicle, Daily Dispatch, Children's Own Favourite, Men Only, Strand, Sunday Telegraph and Razzle - especially the 4-6-page 'Reggie' series. In the 1960s he also drew "Sportrait" pocket cartoons for the Evening Standard. Coram's comic strips included 'Prairie Pete and Pronto', 'Ann Howe', 'Bob and Tanner', 'Wibble and Wobble' and his pocket cartoon series included 'Wartime Humour' and 'To-Day's Smile'.